Ancient Dungeons: Base Pack for MV| RPG Maker | Create Your Own Game! After a long wait and anticipation for her new tileset, we now present you with Celianna's MV resized version of Ancient Dungeons: Base Pack! 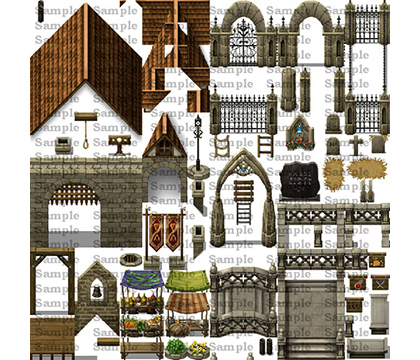 This large pack contains all the basic Exterior Tiles you will need to create cities, villages, dungeons and castles as well as detailed Interior Tiles to decorate those places that populate your game maps. It also includes tons of animations such as fire features, different styles of doors and swiches, and don't forget a secret passage hidden behind a bookshelf! Filled with Celianna's beautifully-crafted signature details, Ancient Dungeons: Base Pack for MV is a must-have pack for all serious RPG Makers!!! Exterior / Interior auto-tiles of TileA x 12 sheets- Floor Tiles, Ground Tiles, Water Tiles, Wall Tiles, Tiles for waterfall, cliff, crop field, grass field, fence, gorgeous carpeted floors, roofs and more! TileB x 5 sheets: Exterior Tiles of trees and nature assets to create beautiful and mysterious forests, and Interior Tiles of detailed furniture to create a kitchen, dining room, bedroom and more! 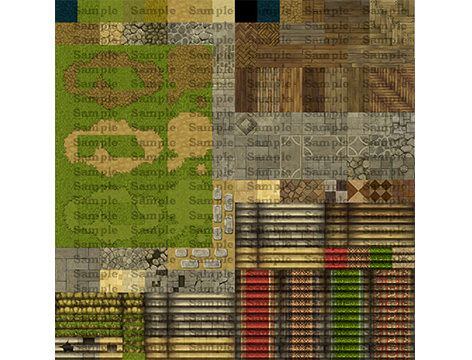 TileC x 2 sheets, TileD x 4 sheets and TileE x 4 sheets for both Exterior / Interior to create towns, villages, castles, caves, crypts and ports! More than 30 animations such as boat, fountain, fire features, chests, sikes, doors, secret passages, switches and much more! Parallax of clutter items packed in 1 sheet (food, books and letters, boxes, plants, candles, vases and more!) and parallax railings for your convenience.